I flew up to the sunshine coast to visit my brother and his family this morning. Not only was he waiting for me at the airport, but we snuck out for a few sneaky trails on our way back to his place. It's been a long time since I hit some trails on the hardtail, and I've got to say, I've missed it a bit. The rocks and roots were swallowed by his big wheels and suspension, but forced me to be clean with my lines and moves. That meant that there was a slight evening of skills and abilities... which then fuelled my competitive nature and I soon found myself pushing hard through blind turns on loose dusty turns. My motivation at 5:10am can be summed up in words that only appear together in Australia. Yeah, nah. On the other end of the motivation spectrum is Cam Wurf, a ex rowing Tasmanian, off riding the Vuelta in service of Ivan Basso. You should read his blog, it's solid, and I'm not just saying that because I have a soft spot for ex-rowers turned cyclists. Because one egg is an oeuf. I planned on doing the Rush shop ride this morning, but I just couldn't get to sleep last night. I was too hot under the covers, I was too cold with any part of me outside the covers and boy was I sweaty. So around midnight I cancelled my 5:20 alarm and eventually dozed off. 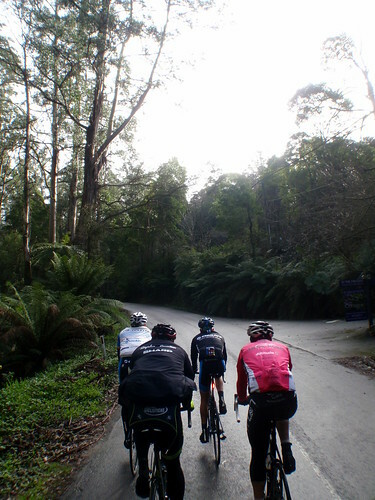 When I got up, I still wanted to ride, so I headed south along beach rd, flicking around at Brighton when I saw the big pink bunch I'd planned to ride with, rolling north towards me. From there I sat in, struggling to get oxygen from my mucus coated lungs. The one time I pulled through, the legs felt good, but I was soon panic breathing. I don't want to get ahead of myself, you know, because I still feel less than average, but I planned a ride on Sunday with Steve. I figure I feel better today than I did yesterday, and that in turn was better than Wednesday, plotting out a trajectory, I think I might be able to manage a couple of hour ride on Sunday... bookended by some coffee... obviously. Even if I'd spent months on EPO, I doubt I could have climbed into bed any quicker tonight. The will was there, but I ached, especially the hips. They felt like I'd backed up sets of heavy deads. Day 3 of the Fair Work Australia protected industrial action, the lungs have joined the picket line, voicing their concerns in a series of hacking coughs. I will not succumb to their demands to stop even thinking about riding my bike. Not yet at least. My body has unionised itself behind this cold or whatever it is. Yesterday's stuffed head was joined by a solidly running nose today. I fear this stop work action will get uglier before it get's better. At this point I am acquiescing to their demands, despite it leading to a few SMS calling me soft. Ok, I might have over done it on the weekend, as I'm feeling tight in the throat and runny in the nose. Just to be clear, this is not regret, it's a blog... but even the words that are on this blog should not be read as regret. They should be read as words. Despite turning up in civies, the nice boys and girls at Dukes were willing to serve me coffee, two in fact. This pleases gaga. I thought my legs were done this morning, but in hind sight it might have just been a serious case of CBFs. I rolled to the front at the start of the ride, pulled one turn, before slinking back a bit to feel sorry for myself. At some point I was next to Jez Hunt, lamenting how my favourite hill wasn't so fun when he's around because he smacks me on it. Later, as we approached that hill I noted Jez had had to push more air than normal, so set about chasing down and passing him with extreme prejudice. Granted I blew a short while before the top, but I'd made my point, and in the process found that my legs worked better than I thought. With this fresh revelation, I decided play in the sprint, wavering from setting myself to perform a lead out, or sprinting in earnest. The heavy headwind was going to make being on the front tough, and honestly I was letting it come down to who's wheel I was on where, because such things are so varied on a training ride that it's hard to predict.Anyway, lights at Glen Huntly spoilt the fun, so that put paid to the whole shebang. From North Road to Southland it was Youngie and I on the front. Two up. Solid tempo. After that I sat in for a while, we'd copped pretty much every red light possible, and the accelerations were not doing me many favours. Into Mordi, I took a deep breath, getting myself mentally ready for the hurt. Then the bunch split. Cars turning right chopped the bunch in half, and I was in the wrong one. Despite looking for some solid hurt time, I wasn't ready for that. When we got the ride back together I set about rolling through every turn. It felt ok... well, you know, it hurt, but that's ok. It was another solid morning into a head wind, with all bar a couple of blokes rolling their turns smoothly until lights and traffic around Elwood put paid to the sprint and thus ended the ride. 2 x Gate start + 1/4 lap @ 100"
2 x Gate start + 1/4 lap @ 104"
1 x Gate start + 1/4 lap @ 104"
2 x Gate start + 1/4 lap @ 106"
1 x Gate start + 1/4 lap @ 106"
1 x Flying 150m @ 82"
Ungh, big gear gate starts, at least they were standing efforts. The 1/2 lap efforts felt better than the 1/4s. Maybe because I was able to get the gears (mostly) wound up. Maybe it was the prospect of more time to recover from errors that kept me calm (and thus performing well) in the gate. There was some new techniques and instructions to change feet. Initially I was reluctant to even try starting left foot forward, but I gave it (mostly) shut up and used it for 2/3 of my efforts. The new technique was about crank position. I'd like to get some solid power and/or time data before commenting and committing to using it, but the theory is sound. It's possible that I'm too rested. Being rested makes me restless. Being restless makes me want to stab people. Stabbing unsuspecting people is (allegedly) bad. So, in the spirit of making me a less not nice person, anyone willing to sign a small waiver and stand in my general vicinity should contact me through the regular channels. Especially if they're the ones responsible for this week's weather. That was the biggest bunch I've seen go long in, well, a long time. Some of the turns, where a good portion of the bunch were rolling through, were neigh on excruciating. It wasn't just the whip effect of being that far back, it was the anguish of waiting, like the lead up to a sprint, but without the potential pay off of a win in the offing. I kept myself tucked away on the hills before Canadian Bay as best as I could. I did have to cover a small gap up Baden Powell, but mostly I sucked wheels and sucked air until we hit the bottom kicker on Canadian. From there I pushed more air than I hoped, setting my own tempo to the false flat, then having to continue the effort when the only one to come around me was Danny Kah, and he did it by sprinting over to the front few guys. Down to the bottom of Two Bays I tried to recover and regain ground. A tough combination that meant I still had a few metres gap when we made the turn into the climb. Like last week I attempted to just settle and set my own pace. Unlike last week I never found the happy unhappy place, and had to spend a lot more mental effort. None of the key times were amazing, but the moderate pace down and strong pace home helped bump up the over all stress score. I wasn't motivated for this, my neighbours had a shouting match for a couple of hours... or rather he spilt wine on the couch and she shouted at him. Despite how long it went on for, I'm still unsure if she was upset that the couch was stained, or that wine was wasted. Probably the latter. The plan was some steady state kms. Nothing earth shattering, just ticking the legs over for a few hours, and hopefully avoid getting too wet. I ticked the first box, the weather was kind enough to enable the second, and I found some mates on the return leg to keep me company.